A lifelong Manitoban, career educator and tireless volunteer has been awarded Brandon University’s 2014 Distinguished Alumni Award for Community Service. Bruce Macdonald grew up in Flin Flon, earned Bachelor Degrees in Science and Education from Brandon University (BU). and taught in Virden for 35 years. His interest in volunteerism began at an early age, after his father contracted polio and was not able to finish building the family home. 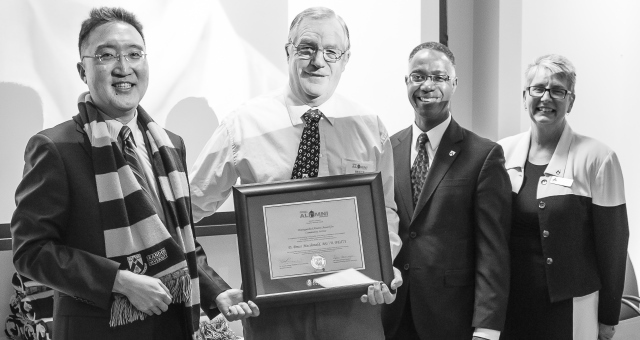 Macdonald has been recognized locally, provincially, and nationally for his leading roles in community building and student leadership activities. He started Crime Stopper groups in nineteen Manitoba communities. He has dedicated countless hours to groups including Kinsmen, Lions, Virden and Area Fitness Co-op, Virden Employment Skills Centre, Virden’s Auditorium Theatre, and the Valleyview Co-op. Macdonald devoted himself to student extracurricular activities – Peer Helpers, TIPS, the Undergrad Committee, and the Grad Committee – and coached debating teams to national championships.